Cook bacon crisp and rough chop. Set aside. Reserve one tablespoon of the bacon fat. Cut potatoes into wedges. Since all-purpose potatoes vary in size, try to keep the wedges uniform. You may get 8 wedges from one but 16 from another. Place potatoes in large bowl and add bacon fat, melted butter, salt, garlic powder and smoked paprika. Toss well to coat. Pour out potatoes onto a sheet pan in a single layer and roast for 15 minutes. Flip and roast for another 10-15 minutes or until browned and cooked through. Mound the potatoes into four piles. Cover each pile with the Machego cheese, then bacon then the cheddar cheese. Place the pan back in the over for 2-3 minutes to melt the cheese. 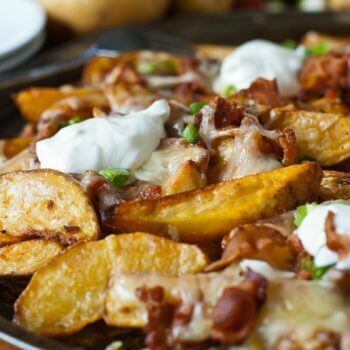 Alternatively, keep the fries in a single layer and cover with both cheese types and bacon and again place back in oven for 2-3 minutes to melt cheese. If serving individual servings, place each portion on a small plate, sprinkle with scallions and place a dollop of sour cream on top. If serving family style, slide fries onto platter, sprinkle with scallions and place several dollops of sour cream on top.